What if you don't like the default workspace? The default interface for AutoCAD LT 2009 looks a lot different from previous releases, with the Ribbon and the cream-colored background being the two biggest changes. Being LT, there are of course many ways to tweak this new look to get it just the way you want it, but the product designers also thoughtfully included a couple ways to get back the "old" look if you really want it. The first tool is the Workspace Switching icon on the right side of the status bar. Left-click, and you'll see a list of two workspaces (more if you've added your own): 2D Drafting and Annotation, and AutoCAD LT Classic. Activating the Classic workspace brings back all the familiar toolbars and menus, so it looks like AutoCAD LT 2008. There's also a button to set the colors back. From the Display tab of the Options dialog box, click the Colors button. On the right side of that dialog is a button to Restore Classic Colors, which brings back the old black modelspace and white layouts from LT 2008. Although I do recommend that you give the Ribbon a try, these two tips will help you stay productive as you get used to the new features. There are many ways to control which objects end up in a selection set. First, you can pick them one at a time by clicking directly on them. Second, you can window over multiple objects. Windowing right-to-left (indicated by green shading, with a dashed outline) selects objects that fall at least partially within the window, while windowing left-to-right (shown with blue shading, and a solid outline) only selects objects that are completely within the window. Third, you can de-select objects by holding down SHIFT and clicking or windowing over the objects. If you're in a command, like Move or Copy, you can also switch to a "remove objects" mode by typing R, in which case you don't need to hold SHIFT to remove objects. Typing A (not S) returns you to the "select objects" prompt. Settings controlling some of these options are located on the Selection tab of the Options dialog box. This tip is good back to LT 2006. Autodesk University doesn't start until December 2, but the time to start planning is now! Registration opens August 8th for AU Online members, August 15th for everybody else. Joining AU Online is free, though, so why not? It's a great resource even without the early registration bonus, with previous years' handouts, networking, and more. The first version of the course catalog (XLS) has just been made available, so you can peruse the 621 class offerings to see what might appeal to you. (My class is in there, Customization 101: AutoCAD® and AutoCAD LT®.) This is the first version of the schedule, though, so changes are still possible. For more about AU, check out The AU Experience, Lynn Allen's "Justifying AU to Your Management", and the AU blog, BLAUG. I know AU isn't cheap, exactly, but compared to other professional conferences, it's a downright steal. Don't forget, when you look at the fee, that it includes your hotel and nearly every meal. If you're going to be there, let me know. I'll be looking for LT people to talk to! If you missed last week's webcast (or just want to watch it again), the recording has now been posted to the AutoCAD LT website. First-ever LT Webcast a Success! The first-ever webcast designed exclusively for LT users took place on Wednesday, and went off without a hitch. Well over 350 people got an hour's worth of LT tips, tricks, and insights on features new and old. Missed it? Not a problem (although I hope you'll sign up for the next one)! The event was recorded, and will be available by July 23 on Autodesk's website, at www.autodesk.com/autocadltwebcasts. Thanks to all who attended, and I hope to see you at the next one! 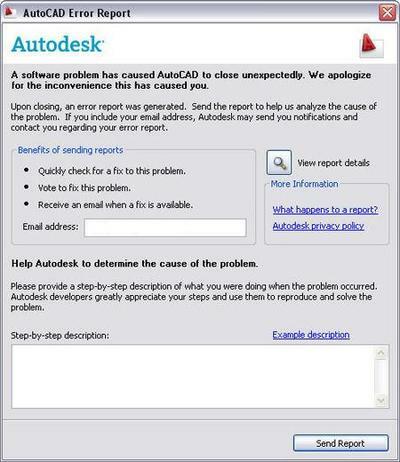 Autodesk has just released an update for AutoCAD LT 2009. You can find 32-bit and 64-bit versions of the update here. It addresses a variety of issues, including many that were identified by customers just like you through the Error Reporting Utility. You know that box that appears after LT crashes, asking you if you want to send in an error report? Real people do read these reports, and the more information you can provide, the easier it is for them to figure out what happened. So be sure to send in your error reports -- we don't like it when LT crashes, but if it does, we want to know! For a complete list of issues fixed by the update, check out the Readme. Are YOU signed up for the webcast? The inaugural LT webcast is almost here -- are you registered? If not, it's not too late! Join the 500+ people who have already signed up by visiting the registration page. It'll be a session full of tips, tricks, and feature overviews, and will have stuff for users of everything back to LT 2006. You've heard me say before that Autodesk is always looking for customer feedback, and here's another example. If you'd be interested in a visit from Lisa Crounse, the LT Product Manager, to talk about LT (what you like, what you don't like, what works, what doesn't) drop me an e-mail using the link at the left. We're looking for people in the Portland, Oregon, area, who'd be available near the end of July. I look forward to hearing from you! This is a tip for all you keyboard-junkies out there. While one advantage to palettes is their ability to dock to one side of the screen and roll up until you need them, sometimes you just want to open them quickly and close them when you're done. You might know the shortcuts to open a palette (usually Ctrl plus a number, like Ctrl+3 for Tool Palettes), but did you know that there are commands to close palettes as well? Obviously these are a little long for typing in every time, but you can make your own shortcut in the PGP file, and close your palettes with ease.